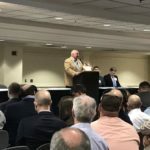 Secretary Sonny Perdue announced the long awaited ginning cost share program first thing this morning at the Mid-South Farm and Gin Show in Memphis. Additional details were released late this afternoon. Please follow the link below for the information straight from USDA.